I have been decoding VOA Radiogram broadcasts for many months now, usually with pretty good results. I starting decoding during the winter months, when shortwave propagation favored my location. Now that we are moving toward summer, shortwave propagation is starting to work against me. VOA Radiogram program 103 was the first broadcast that I wasn’t able to decode fully. 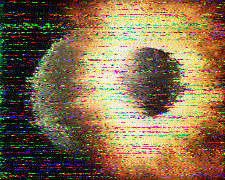 Only three of the five images decoded and the quality of the three wasn’t very good. My reception of the 17860 kHz signal gets worse every week. For the first time, I was unable to decode the text for a good portion of the program. Only the final four of eight articles of the broadcast decoded successfully. It is a testament to the robustness of the MFSK32 mode that I was able to decode anything at all, even with the poor signal I received. I suspect that a better shortwave antenna could do a lot to improve the strength of the signal. It’s also true that at these low signal levels, interference from my computer starts to be a problem. Three of the five images decoded (although not the same three as the 17860 kHz broadcast) but only three of the eight articles. The signal from the 15670 kHz transmission came in much stronger this week. Unfortunately, that didn’t help with my decoding because the garbled audio interference that I experienced last week decoding VOA Radiogram Program 102 was back again and was much stronger this time. I tried multiple radios and the interference sounded just the same on each. I had thought that the interference might be from a local ham or CB operator with a transmitter problem. It turned out that I was wrong about it being from a local source. I could make out more of the garbled audio this week and it clearly derived from the transmission from WWCR on 15825 kHz. Why didn’t you decode 5745 kHz this week? Would it have been better? I didn’t quite understand. Is the WWCR problem with the transmitter or your receiver? Can you do anything about it. I didn’t have a chance to decode 5745 kHz, but I suspect it would have come in better than the higher frequencies. I hope to give it a try next week. I suspect that the WWCR transmitter is creating the spurious signals, but I don’t know for sure. I reported the issue to Kim Andrew Elliot, so we can see if he has any suggestions.